create an invoice accumulating all deliveries details for the selected customer. VAT and totals are automatically established. A flag '#' in the Infos field of the list warns you about pending invoices to be issued. The Menu bar gives you access to the Files manipulations, Parameters, Options and the Actions detailed as in the Command bar. No deep explanation of all these buttons is here required, plenty of information and warning dialog windows are displayed for most started actions. When the user feels secure enough with the programs he can disable those infos via the options menu. Here follows some important features descriptions of the program. 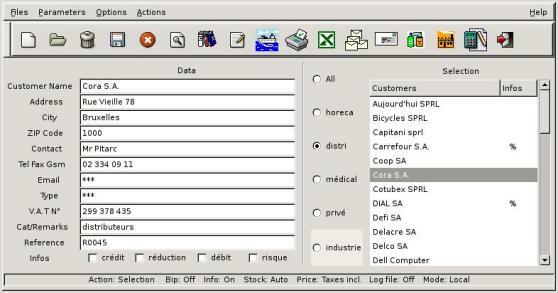 In the selection area, filters criterias (Categories) can be created via the parameters menu. 30 categories can be declared, the length of each shouldn't exceed 20 characters. The way you choose criterias is completely free. The filter process will display all members whose 'Cat/Remarks' first word will match the clicked category button label. A 4 info flag toggle buttons set '$' , '!' , '%' and '&' is also available in the data display area. Here also, you can modify each info label as you like in order to fit your own management design. Those categories and flags have impacts on mailing, listing and export selections. You can choose from the menu what Boolean law you want to apply on the flags filter. You can set or reset all flags in one go. A Grep search thru the history files is available via the menu. The button 'Listing' is available from the tool bar for the three windows, a filter mechanism is based on a logical OR calculation of the activated flags. If none are selected all the items are listed.